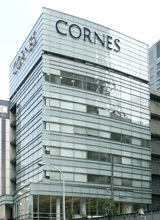 Cornes Technologies is constantly seeking innovative products and advanced technologies to introduce to the Japanese market in response to the needs of business and industry. With a network of international partners that extends across the globe, Cornes Technologies is able to bring to the attention of its customers the very best that the world has to offer. In an era characterized by rapid change and advances in knowledge, Cornes Technologies prides itself on a proven ability to respond swiftly, flexibly and successfully to the diverse requirements and demands of the modern business world. Cornes Technologies not only continues to work in support of Japan’s economic growth but also to promote the development of friendly relationships and cultural exchanges between Japan and other countries. Cornes Technologies is also committed to the concept of corporate social responsibility (CSR) and to the adoption and strict application of policies designed to preserve and protect the environment. From 1st April 2017, Cornes Technologies Limited has re-absorbed its former subsidiary, Cornes Dodwell Coding Limited, which was originally established as a separate entity in 2008, and re-organised internally into two virtual, in-house companies. The Technology Company, under its President & Representative Director, Masahiko Yamaguchi, deals with the import and distribution of high-tech products and equipment and also the manufacture and sale of diamond chemical vapour deposition (CVD) systems. The Industrial Machinery Company, under its President & Representative Director, Yuji Noda, has responsibility for the printing, packaging and inspection businesses. Most recently, with effect from 1st April 2019, we transferred the industrial printer business, a major business unit of the Industrial Machinery Company, to BROTHER INDUSTRIES, LTD. in order to raise awareness of the industrial printer Domino brand and expand the business.